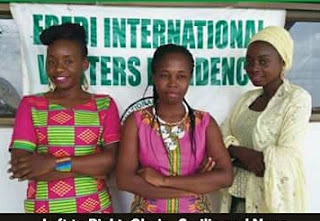 Three female writers from Kenya, Ghana and Nigeria have arrived Iseyin, Oyo State, Nigeria for the April-May 2017 session of the Ebedi International Writers Residency. They are; Gloria Mwaniga (Kenya) Cecilia Sefa Amoafowaa (Ghana) and Nana Aisha Abdulqadir (Nigeria). Gloria who is a graduate of the University of Nairobi is a freelance writer with the Nairobi based Nation Newspaper and the East African Newspaper. She is the author of two children’s books with Moran Publishers (2013 and 2014) as well as the author of a soon to be published Paper titled Reconstruction of Womanhood in 21st Century Narratives for FEMRITE. Gloria also has Poetry publications in two anthologies ‘Fresh Paint’ by Goethe Institut and Amka Space for Budding Writers-2010 and 2015. A Certified Script writer and Adjudicator at the 2015 Kenya Schools Drama Festival, Gloria has also written numerous arts and culture articles online at www.nation.co.ke and theeastafrican.co.ke. Her soon to be published Short Story, BOYI was shortlisted in Writivism. Gloria wishes to use her time at the Residency to complete work on a new novel. She will also understudy the art of weaving of AsoOke by the Iseyin weavers with the hope of imparting her knowledge to students in Iseyin and Nairobi. Cecilia Sefa Amoafowaa who holds a Bachelor of Arts degree in English from the Kwame Nkrumah University of Science and Technology, Kumasi Ghana is a teacher at the Tamale Senior High School, Tamale, Ghana. Currently the Vice President of the Ghana Association of Writers in the Northern Region of Ghana, Cecilia is also the author of the book, Poetry Excursion on an African Mind (2014) which was selected for study for the 2015/2016 and 2016/2017 academic year at the Kwame Nkrumah University of Science and Technology. She has also published an online novel entitled, Secondary Rhythms. In addition, she has featured in many publications such as Myjoyonline’s Poetry Delight, the Mirror Newspaper and some online magazines. Cecilia who is a major newscaster on Bishara Radio and a regional newscaster on Savannah Radio in her native Ghana, is also the President of the Ghana based Autism Help Foundation. She will work on her Autobiography and another Poetry collection during her residency. She will also mentor Iseyin students in the art of story -telling and the preparations of some Ghanaian dishes. The third writer, Nana Aisha Abdulqadir who is a native of Niger State is a student at the College of Education, Minna. She has attended many Writers Conferences and Workshops and has had a stint as a Presenter on the Niger State Television Station. During her stay in Ebedi, Aisha will complete work on her debut Literary books, a Novel entitled Icicles of Desire as well as a poetry collection; What Next. She will also mentor Iseyin students in the art of Public Elocution as well as teach them some Hausa and Fulani songs and dance. The Ebedi International Literary Writers Residency is a private Initiative for writers to complete ongoing works in a conducive environment at no cost to the writers. Since its inception about eight years ago, the Residency has hosted over 80 writers from 8 African countries. Many of the past Residents (Fellows) have used the Residency to produce international award winning books. The latest is Ayobami Adebayo a 2016 Ebedi Fellow whose novel; Stay With Me was recently shortlisted for the 2017 Bailey Women’s Prize for Fiction.